I remember the first time a stewardess page a name of a passenger. It was on my first solo travel to Taiwan. As I munch on a steamed bun before boarding the flight, a voice echoes the whole airport, sighting four names repeatedly. That must be nerve-racking and embarrassing, I thought. To have your name called. My best friend and I arrived at the terminal two-hours-before the flight, we proceed with the check-in counters, took some pre-departure shots and fill our stomachs. But for some reasons, we lost track of the time and had no idea of the trouble we went into until we heard a guy shouted "Incheon! Incheon!" "What are you still doing at the immigration booth? The plane is about to take-off." We asked the people on the line if we can go ahead of them and they agreed, thank you. Gladly, we had no problems with the documents but the lady officer scolded us before we left for the final security check-in. Yes, ma'am, we deserved it. Sorry. That time I learned the value of a minute, no seconds. We sprint in the hallway without paying attention to the onlookers as we mumble and complain of how the gate seems too distant. I stopped for a second and look back at how my friend is doing. I chuckled, I forgot she's wearing wedge boots! Just a week ago, I kept on telling her about how I felt nothing about this trip and thoughts of not going anymore. And now, I'm running eagerly as if my life depends on it. Hillarious. We did manage to reach the boarding gate of humiliation. Kidding. But entering the plane felt the most discomforting. Okay, here we go, I told her. With our head faced down, we bravely walk the twin-aisle aircraft ignoring the glances of peevish passengers on the way to our designated seats. That was embarrassing! I could have sunk through the floor. So this is how it feels to almost-miss-a-flight. Still panting, we sat comfortably as if nothing happened; fastened our seat-belts and get ready for take-off. In a minute, the captain pilot commences closing the doors. I looked at my best friend and both laugh. What a great start huh? Way back in 2008, exactly 10 years ago, my best friend and I made a promise to come to Korea before we turn 25. We were just in high school that time and have no means of getting to any place, nor have a concrete plan of how we are going to make it happen, so it's more like a wishful thinking, I guess. 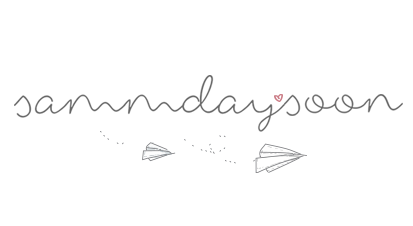 A random, impulsive decision probably cause by watching the Korean drama "Princess Hours" (Goong), still my personal favorite to-date. Fast forward to December 2016, I scored a cheap flight from Incheon to Manila and planned a short trip October next year (2017). And then, later on, convince my best friend to come with me of what was originally a solo travel. Oh, the struggle and hassle we went through before this trip is no joke. We couldn't match our travel dates though we already booked our round-trip tickets. She's an accountant by the way and has to secure a month-end due. Just as we about to make our last resort, rebooking, which was too expensive, the airline company contacted us about a sudden change of flight schedules. To make the long story short, we were able to book the flight again in our desired dates with no frills and charges. Yes, FREE. It was like a perfect scenario of what Paulo Coelho wrote in his book, The Alchemist... "and, when you want something, all the universe conspires in helping you to achieve it" or God, as I like to call it. All Philippine passport holders are required to secure a visa to travel to South Korea, starting July 1, 2018, the application will be processed through designated travel agencies due to an increased number of applicants. I can only speak for the category "Employed". Based on my experience, Certificate of Employment play a huge role in the process. Some of my colleagues and seniors also mentioned that if you can show them that you've been working for a company in a long time, let's say 5 years in my case (or at least a year, they say) there's a high chance that you'll get approved. As for the other documents, visa application for South Korea is a bit arduous since they also require the bank statement and certificate with ADB (Average Daily Balance) which means they can monitor your debit and credit transactions for the last 3 months. Both of us are first time travelers to South Korea and haven't been to any of the listed OECD countries. I was quite nervous about my best friend's application because her bank certificate reflected a low ADB of around 5000 PHP. She put this large sum of money on her account just 3 days before our visa application but it worked! Also, there is a section in the application form where you have to state your estimated travel cost in US dollars, make sure that your bank account balance is larger than what you'll declare here so they will assume that you have more than enough for your trip. For more detailed information and process, click here. 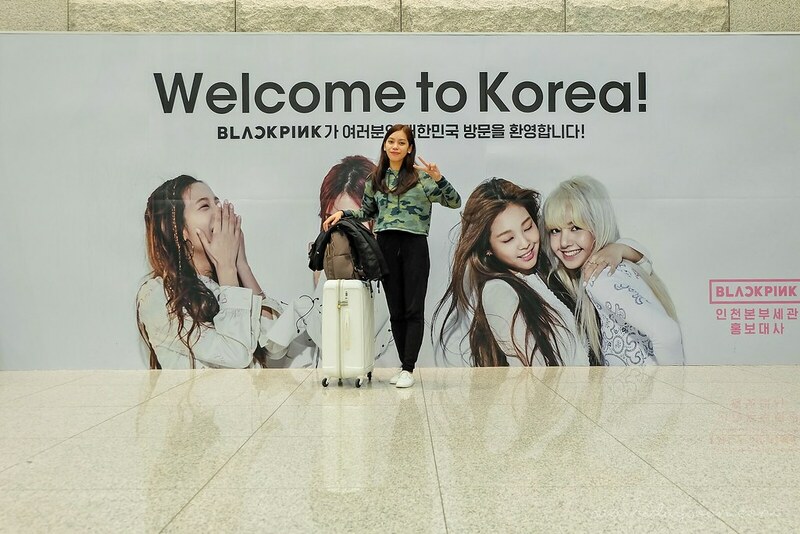 It takes about 4 hours and 5 minutes to get to South Korea from Manila via Incheon International Airport. Philippine Airlines, Air Asia, Cebu Pacific, Korean Air, Jeju Air, and Asiana are among the carriers that offer direct flights. 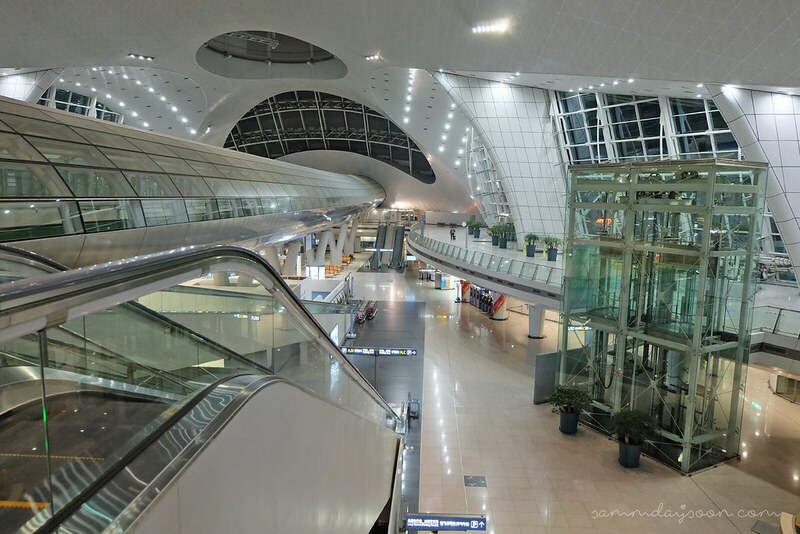 Incheon International Airport (ICN) serves as a major hub in Northeast Asia and thus rank as one of the largest and busiest airports in the world. It's huge. Once you arrive and exit the plane you will pass through a long hallway and series of escalators. After that, you will transfer via a shuttle train to reach the terminal for passengers using Gates 101-132, which came as a surprise to us. My initial thought was, if our near miss-flight incident happened while departing Incheon, we would definitely not make it on time. To read more about arrival procedures, click here. Incheon International Airport sits 48KM from Seoul Station. That means you need to travel for another hour to reach Seoul depending on your mode of transportation. The most popular ways to get to the city are the following: Airport Railroad Express (AREX), KTX, Airport Buses, and Taxis. Among these, we find the Airport Railroad the cheapest and most convenient. AREX operates two types of train: the Express Train and the All-Stop-Train which stops by 13 subway stations before it reaches Seoul. Since we arrived at almost midnight, we decided to rest at the airport and wait for the first train at 6 am. We opted for the All-Stop-Train using the T-Money card and paid at least 4,150 Won each. For more detailed info, click here. 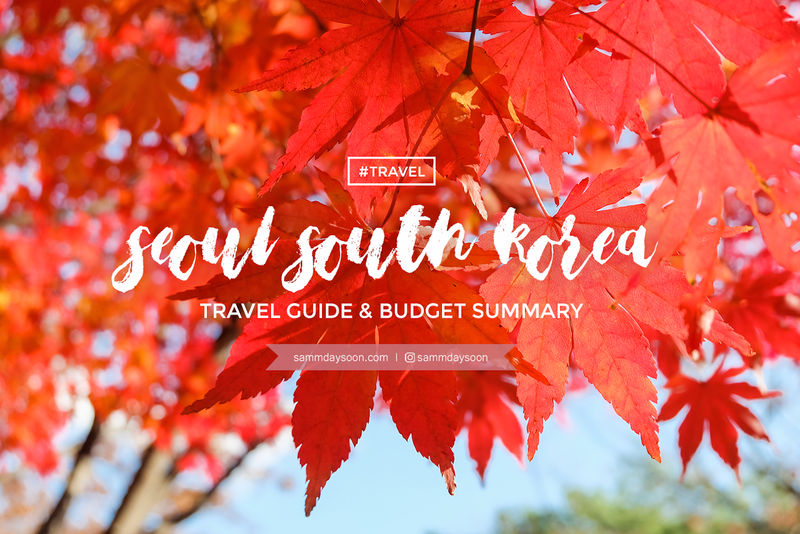 We initially planned a 10-day trip including Jeju and Busan, however, due to some difficulties, we trimmed it down to only 6 days around Seoul with the following things in mind; a time for Nature (Autumn), Heritage/History, Urban/Arts, off-the-beaten paths, I even added a university tour and kdrama sites along and a visit to at least one cafe. 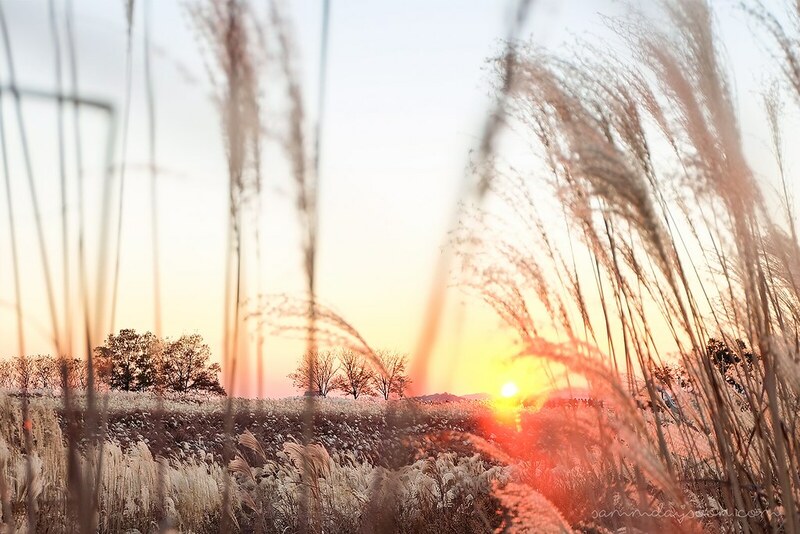 I made a checklist of all the "must" from food to places, what to buy, beautiful sunset spots to the most rewarding activities to try and experience the best of Korean Culture; the list was endless. But six days around Seoul sounded like an intro to a twelve-track music album; it's short, too short, but will leave you with a lot of anticipation. If you want to check our itinerary, I made a copy of an excel file in the link below. We didn't get to all the places I listed, sadly. Nevertheless, you can still use it for your future reference. I always got these questions from my friends. First, if Korea [Seoul] really look like what we see on a television drama. No doubt it is. That place looks surreal in autumn. Second, was it expensive there? This one, I'll give a Yes and No for an answer. I observed that every travel expenses always vary based on someone's interest but with an exemption to the country you visit. For example, traveling to South East Asian countries are exceedingly cheaper than Japan. With South Korea [Seoul], however, if you are traveling for food, whether you are a blogger or just an enthusiast, that would be a bit expensive on the side. An average restaurant can cost around 7000 ₩ - 18000 ₩ a meal and a cup of a regular cappuccino can range between 3000 ₩ - 8000 ₩ approximately. If you would notice in the chart below, even our budget for the food took the second highest spot following the Airfare and Baggage fees. Since food will take up most of our budget, we decided to stick to a maximum of 15000 ₩ a day each, take into account that our lodging also provides a free complimentary breakfast. We also opted to stay in a hostel with a walking distance to a public market were food and goods are not only local but incredibly cheaper than other districts specifically Gangnam and Itaewon. Places around the university belt like Hongdae, Sinchon, and Ehwa are also recommended since most of them are student-priced. I booked my round-trip tickets separately from Cebu Pacific airlines. As I mentioned earlier, I scored a flight from Incheon to Manila for 37000 KRW / 1622 PHP + 400 GetGo Points, and Manila to Incheon when they offered a VISA promo for 2099 PHP. We also availed 15KL MNL-ICH and 20KL ICH - MNL baggage each and paid the 1620 PHP travel tax. We stayed for 5 nights in Yooginoong Guesthouse in Mangwon district. A single bed in a 6 Person (Female) Dormitory room cost around 25000 KRW / 1152.5 PHP but we got a deal in Agoda for half of the price. It has a close proximity to a public market, two subway stations - Mangwon and Hapjeong, plenty of local street foods and restaurants, and a one-stop train to Seoul Worldcup Stadium. 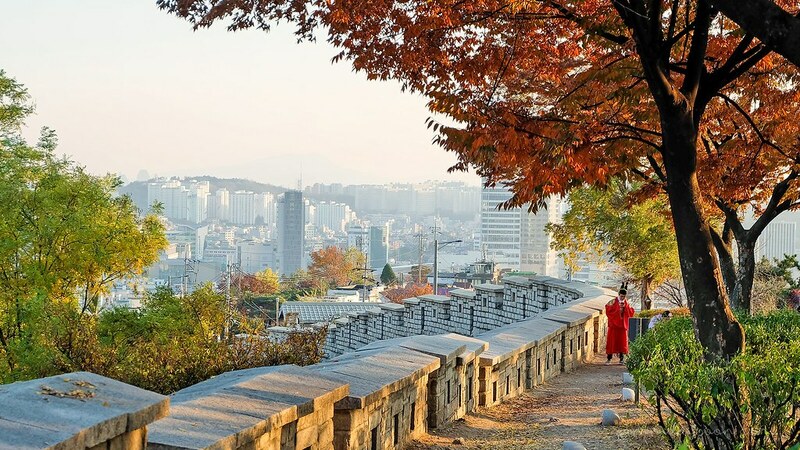 If you would notice, Mangwon is quite far from the center of Seoul's main attractions but we personally chose this place to enjoy the best of both worlds; to spend a day in the busy streets of Seoul and enjoy a quiet and relaxing night away from all the lights and noise of the city. Going around in Seoul is easy with their organized and efficient transport system. 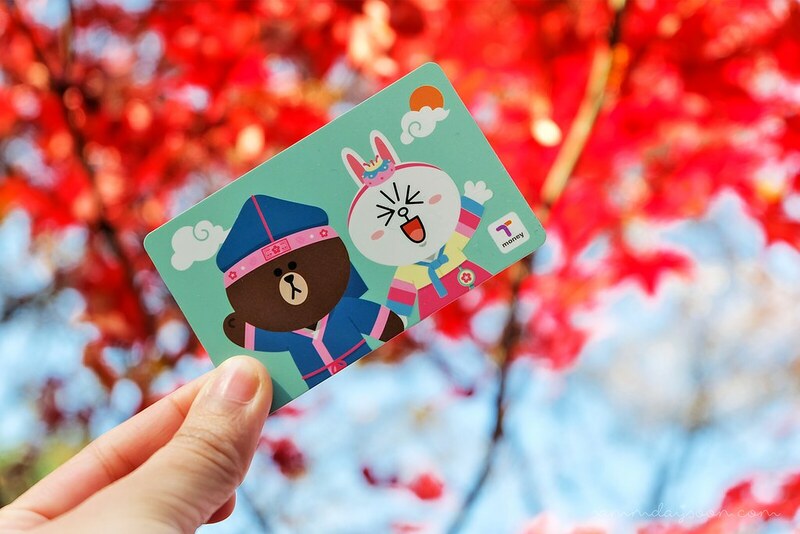 We got this Line Friends themed T-Money Card from the Airport for 4500 KRW / 207.45 PHP and tap it with 20000 KRW / 922 PHP initially, which was good for 3 days. I think we only used a bus once in Gapyeong (to Nami Island) and the rest in Subway. Overall, we spent roughly 47000 KRW / 2166.70 PHP for six days including the round-trip AREX and train to Nami Island via Gyeongchun Line. For more details, click here. How we managed to spend 18000 Pesos all-in for 6 days in Seoul without sacrificing the fun and the trip itself, sounds too good to be true to all of my friends who asked. Yes, we thought Korea was expensive too. But you see traveling doesn't always have to be grand nor too ordinary. You only need to make the most of what you have for the best experience you could get. Check the Seoul Subway Map here. 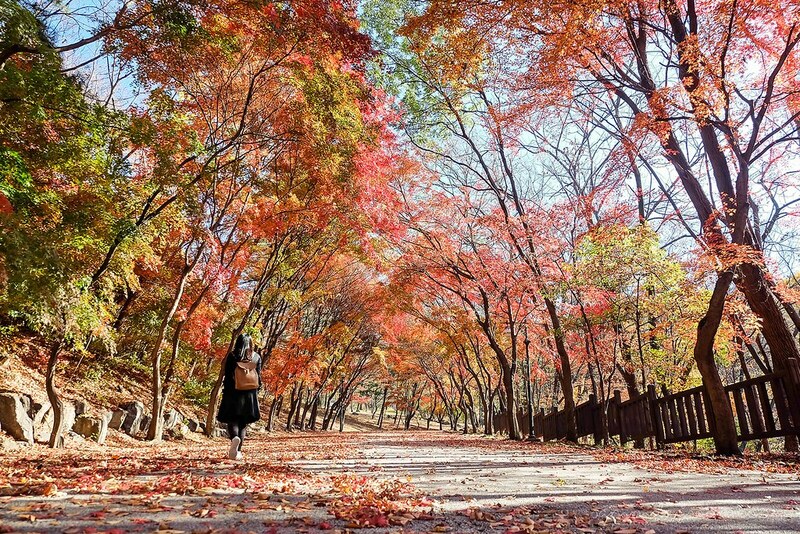 Autumn in Korea starts from September to November but foliage only lasts for two weeks, usually around the end of October and early November. 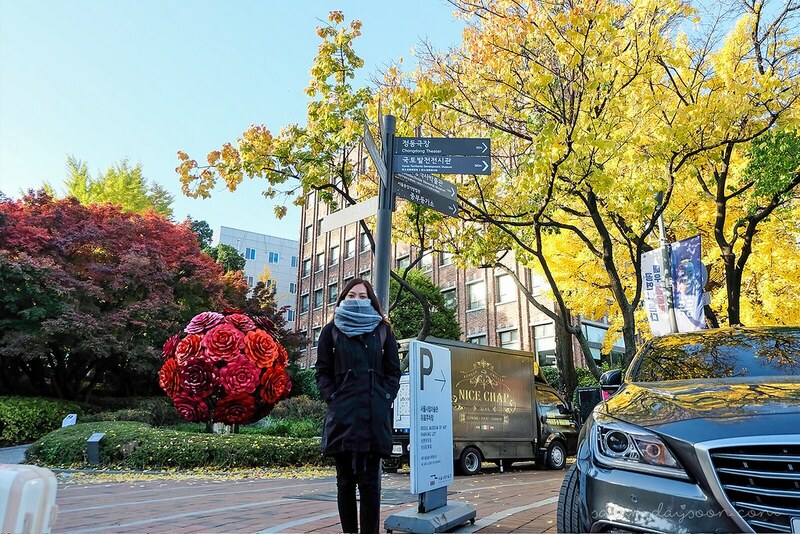 During our stay, the leaves have already turned riped and most have fallen to the ground, nevertheless, we are in awe and blessed to have witnessed the magic and beauty of Seoul in Autumn. Let me share with you some of the highlights and our favorites from the trip. Ps. 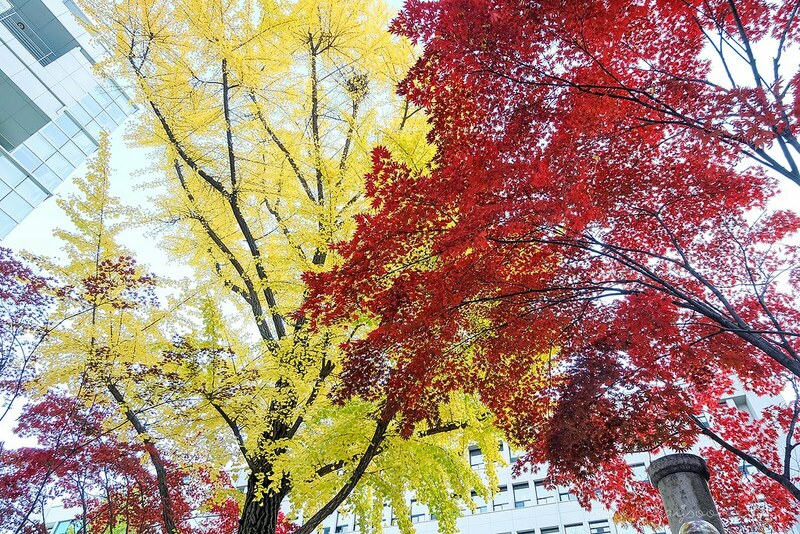 Autumn does really make someone fall in love. For someone who's not-into-coffee, having a low tolerance to caffeine, coffee shops obviously don't sound appealing to me, but with the exception of this one. 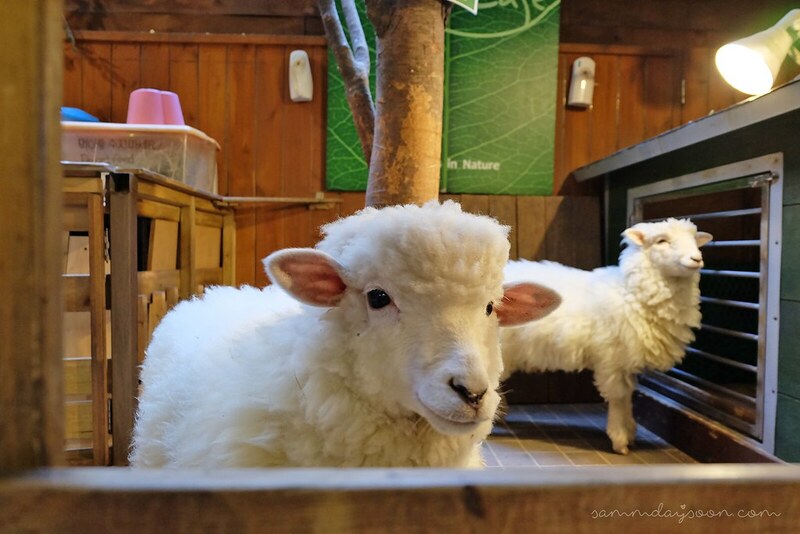 Maybe, drinking coffee occasionally wouldn't be so bad especially if you'll be greeted by this two cute and fluffy sheep from Thanks Nature Cafe. Say Hi to Honey and Sugar! Baaaaa. If you are traveling to Korea for the first time, K-style Hub would be a good introduction. From medical, food, hanbok, to Kpop/Hallyu experience this five-floor complex has all the information to meet your needs. 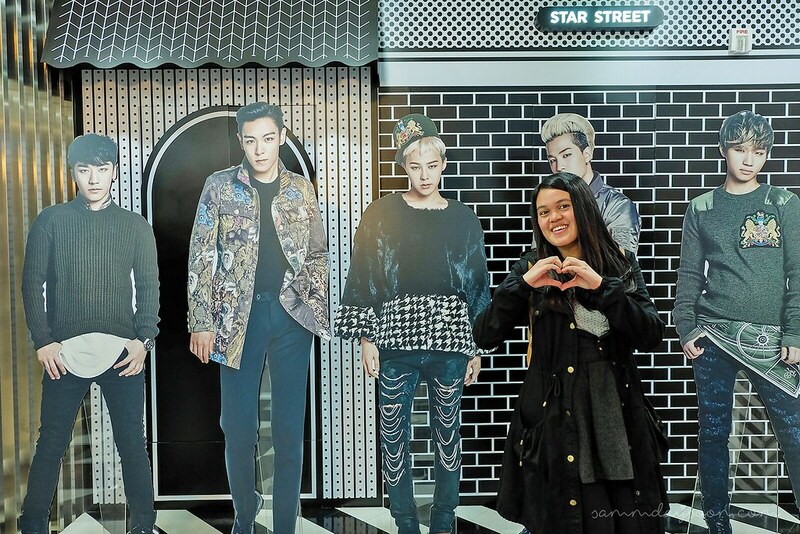 Just look how my best friend enjoyed the company of BigBang. 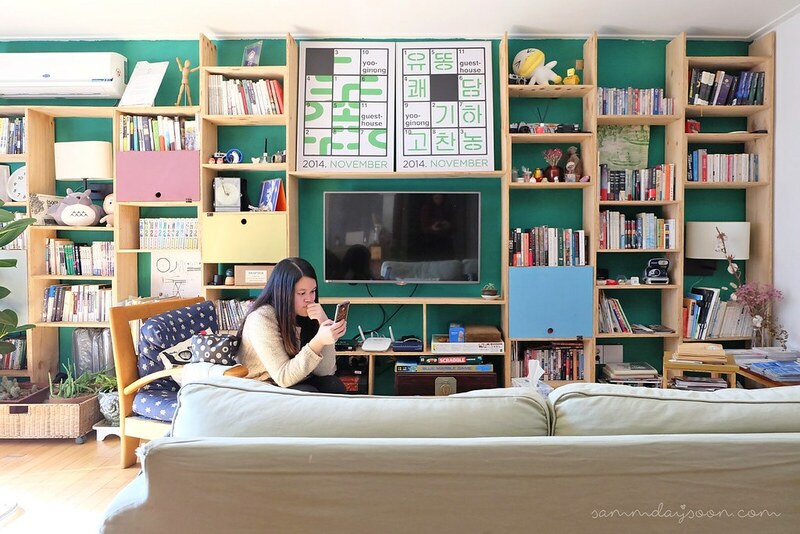 For more info, read 8 ways to have fun at K-style Hub! What I did was exchange a few dollars, around 40 USD in the airport to cover my transportation and food expenses for the first two days and exchange the rest in Myeongdong. Out of the two options, I find Myeongdong to have a better rate if not, the best in Seoul. You can find several money changers on 2-Gil Street (take Exit 5 from Myeongdong Station), near the Chinese Embassy. To learn more, click here. I almost regret coming to Seoul, it was nothing like what I experienced in Taiwan before. I didn't get to mention above but on our first day I had Cold Urticaria. It's a skin reaction that appears within minutes after cold exposure. 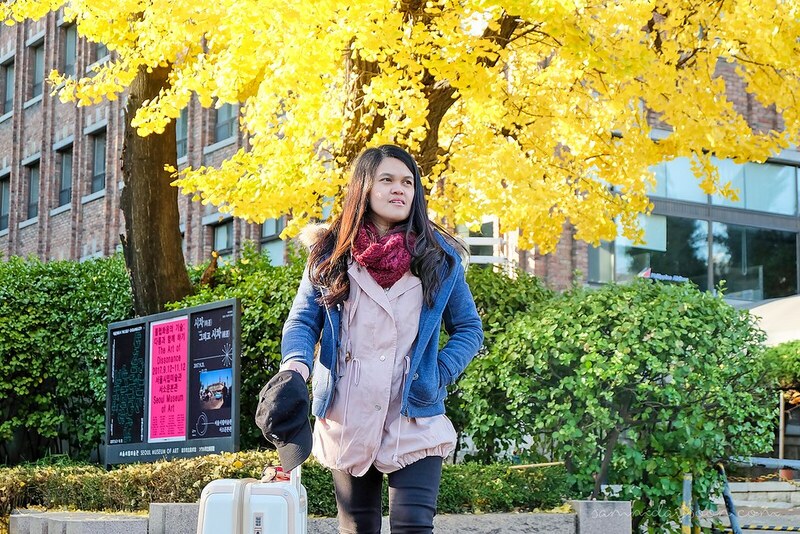 When we exit the City Hall Station, my best friend and I both exclaimed at the sight of the first autumn trees but after thirty-minutes, my skin started to turn red especially in the exposed parts like face and hands. I thought it was just like what I experienced in Taiwan, but it gets worst. After another 20 minutes, my skin gets swollen, my heart started to race and had difficulty breathing. We look for a convenience store and bought heat packs, it didn't work. It was around nine in the morning, four-degrees Celsius when we decided to cancel all our plans and head straight to our hostel. Maybe the owner would be kind enough to let us check-in early or allow us to at least standby the living area, which they did. But by the time we reach the subway station, I felt almost like fainting. Thank God, for the subway station. Haha. During our stay, the temperatures were around 4 - 11 degrees Celsius averagely. But it drops to zero to negative in the morning and evening. I woke up one time at 6 only to find out that it's -4 degrees outside, I just laugh it out and get back to sleep again. The funniest part was how it looks perfectly fine outside your room window at 8 AM. The sun was so high and bright but as soon as you step out of that door, it will be freezing like there was no sun at all. Here's the good news, our bodies are made to adapt to different temperatures. For the first 2-3 days, it will be really distressful but after that, your body will eventually adjust and soon you'll get use it. Even this frail, tropical body did, so do you. Always dress in layers and bring thermal wears. Knitted scarfs and sweaters are proven effective. Our get up are usually the combination of this: thermal wear, leggings, sweater top, pants, coat, socks x 2 and scarf, then heat packs. Stay warm. 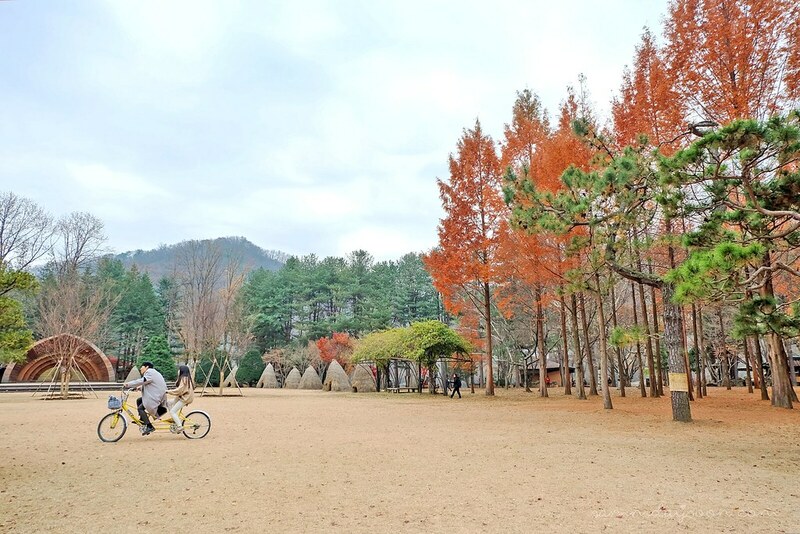 What I like about traveling to South Korea is that they pay a lot of attention to boosting the countries tourism and thus provide a lot of options and coupons for all types of travelers. Check out the links below. If you are looking for some places to shop, we found the locations below to offer varieties and cheaper items in Seoul. This trip made me realize how life can be unpredictable and exciting. Who would have imagined that after 10 long years, what was once a wishful dream could become a wonderful memory? Okay, not all. At that time, when I was having trouble breathing and carrying that heavy luggage to the subway, desperately looking for a refuge, these words kept on playing in my head "why are you here", "why am I doing this", you could have just stayed at home and rest. Regret and fear came like a flood ready to overtake me. And for a moment I forgot the joy of traveling and the very reason why I came here. If there is one beautiful scene from that horrible clip, it would be having someone to lean on the shoulders as you slowly recover. I'm glad I'm not alone. Seoul however, is such a pretty place. The buildings are designed with sophistication, foods are well presented, there are numerous art installations and everything was instagramable. Streets look like a fashion runway or a set for a rom-com movie. It's a vibrant, fast, busy and modern city. Here I find the most stylish people, police officers look like celebrities, subway billboards are filled with birthday greetings for kpop idols and makeup stores are surprisingly available everywhere even in public markets; the beauty standard was undoubtedly set high here. It is also a city where urban and tradition coexist. The palaces and cultural assets are well preserved and I like the fact that you don't have to go far to relax and enjoy nature. From a single perspective, this could be a perfect place to live. 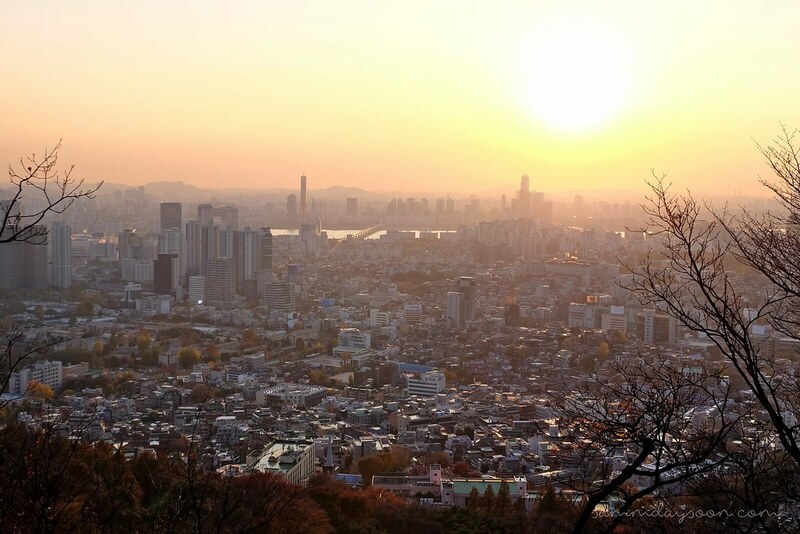 But without all the glitz and glamour, Seoul impose a cold impression. I rarely saw Korean initiate a smile and they seem to live a fast-paced lifestyle. The country is also known for their drinking culture. It's a common sight to see Ajjusi's (old men) drunk in subway stations, sometimes they shout but nobody cares about it and everyone just continues with their own businesses. I remember on the first night when we encounter a couple on the street, the girl collapses on the floor and people flocked to the scene. A group of three friends offered help but the guy refused and asked them to leave. We certainly don't know about their conversation but by the look of it, those three left pissed. I did not understand what I saw when I was there, but now I do, perhaps. Everything was all part of their culture and people are living under a lot of pressure. What we actually watch from televisions are not purely fiction, they're real. I thought that only those in developing countries like the Philippines are in this kind of situation but it proved me wrong. People are striving all over the world whether you are in a first or third world country, it's all the same and sometimes there's a greater weight for those on top. Korean people, from what I observed don't tend to show their affection easily but when they do, they won't care about the world. You'll see a lot of couples in matching outfits and dreamy, romantic scenes in the middle of the streets.